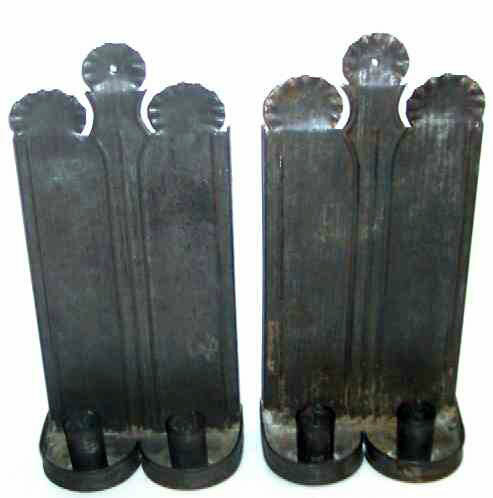 Presented here, a fine pair of Tin Sconces with double candle cups. The form is simple, yet quite graceful because of the size. They stand 15" high and are 7" wide. 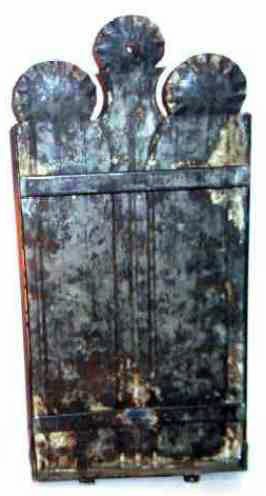 Made of tinned sheet iron they are built for solid and have the wonderful patina of old pewter and minimum surface rust. At some point in their life they were painted and a bit of residue still remains, mostly in the drip pans and on the back and is mentioned for the sake of accuracy The years have been kind to these and they are in overall very fine condition. The construction on these is phenomenal! The edges on the sides and bottom are folded over making the sconces very sturdy and the crimped tops are the work of a master tinsmith. 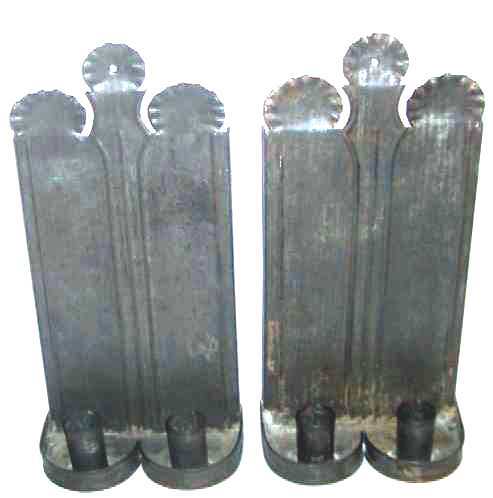 The backs are further reinforced with two iron strips that keep the sconces solidly in place. In addition, there are also two little tabs on the bottom of each sconce that could be used to secure them more firmly (and safely) into the wall or could even be used to attach them to a free standing shelf or table rather than to hang them from the wall. There are two little holes in the back that give access to the candle cups where a rod could be placed to eject the spent remains of the candles from the candle cups and holes in the bottom of each candle cup that would serve the same purpose. A single grommet has been inserted in the bottom of each sconce that would indicate that they once were electrified and then put back to burning candles when the wiring was removed. The alteration is unobtrusive, just a tiny little grommet in the bottom.